In last article we discussed common bus schemes used in substations. We felt the importance of the circuit breaker. Here we will discuss more about the circuit breakers. Although here the primary concern is about the breakers used in HV, EHV or UHV substations the basic is still applicable to low voltage breaker. Also Switchgear is a very common term often used by power system engineers. Switchgear includes circuit breaker, protective devices, and also measuring and control devices. The main function of the circuit breaker is to break and make the circuit. So theoretically a circuit breaker is a switch. The breaker is rated so that is should be capable to make, carry and break load current during normal operation and interrupt large fault current in abnormal conditions. Circuit breaker is the main equipment for controlling power flow and safety of other equipments and personnel. The different associated elements and basic functioning of the circuit breaker is illustrated in the simplified Figure-A. The breaker can be operated by a trained substation personnel by pressing the button at the control room. But during the fault condition it trips automatically. When fault in the line takes place the large fault current is associated with the increase of secondary current in current transformer (CT). This will actuate the relay and relay contact closes. 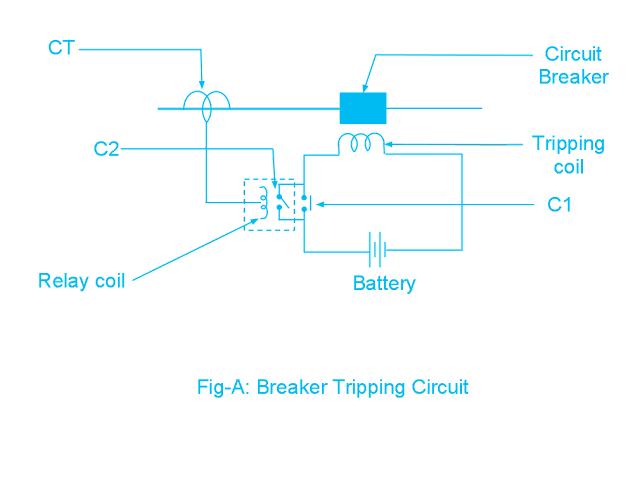 Now as the tripping circuit of the breaker is complete the trip coil is energised. The energised trip coil initiates breaker mechanism for moving the circuit breaker moving contact away from fixed contact. The Arc formed between the moving contact and fixed contact is extinguished by breaker arc extinguishing mechanism. The breaker is open. From the figure it is clear that the breaker trip circuit can be closed by closing of either of the contacts C1 or C2. While C1 is for manual closing by pressing the button at the control panel, the C2 is closed automatically by breaker relay for abnormal over current condition sensed by CT. These two contacts in parallel fulfil the logic OR function. Applying same reasoning it is easy to think that the breaker can be logically conditioned for tripping on other abnormal conditions. The trip circuit is supplied with DC battery source. Independent AC source may be used for trip circuit. It should be noted that for high voltage breaker the fault sensing device is outside the circuit breaker where as in case of low voltage breaker the sensing device is accommodated within the breaker enclosure. During separation of moving contact from fixed contact electric arc is produced between the contacts. Extinguishing of the arc is the most important part of breaker functioning, which greatly influences the breaker design. Actually in low and medium voltage case, the arc extinction is not of much problem. The arc extinguishing is a difficult task in HV and EHV or UHV circuit and is the primary concern for breaker design. The energy stored in the line/circuit inductance is dissipated in the arc and the arc is required to be extinguished reliably. From the above discussion it is observed that the circuit breaker functioning is comprised of three main components. The breakers can be classified several ways. The most important classification is the medium used for arc interruption. For low and medium voltage use, air is mainly used as the medium for arc extinction (In past, oil was also used for 430/220 volt system). In HV, EHV and UHV substations oil and gas is used as arc quenching medium (In the past Air Blast breakers were also often used for HV/EHV/UHV application). Like low voltage system, Oil Circuit breakers are also becoming obsolete for higher voltage use. Vacuum is also used for arc quenching. 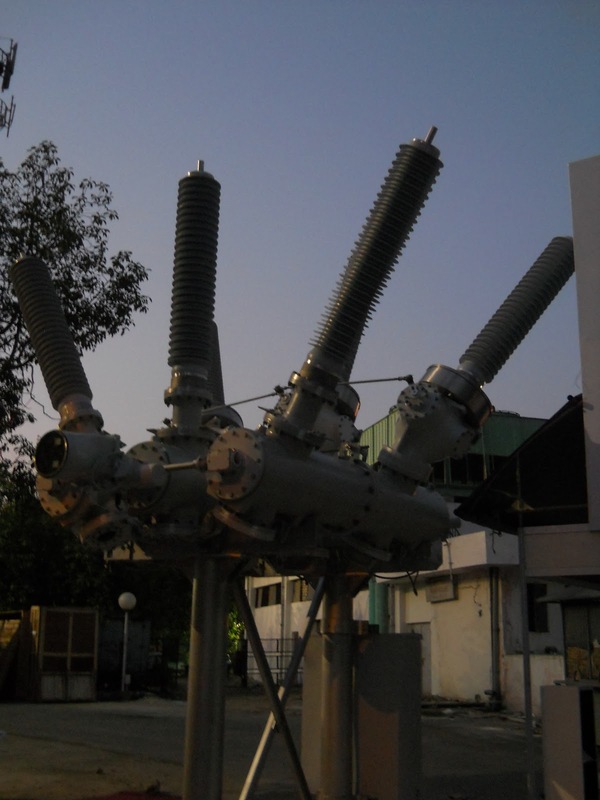 Vacuum circuit breakers are usually used for breakers in the range of 3 kV to 38 kV. In modern EHV and UHV substations SF6 gas breakers have replaced the Oil circuit breakers and Air Blast circuit breakers. But one can still find Oil Breakers and Air Blast Breakers in many old substations. SF6 is a superior gas having good dielectric strength and arc quenching ability which has proved to be a better medium for arc quenching in the breaker. An UHV SF6 Circuit Breaker is displayed below. The circuit breakers are also available as single tank type or separate tank type. In case of separate tank type, each phase has a separate tank. For EHV application separate tank type breakers are preferred. The circuit breakers can also be classified from the point of view of operating mechanism. The operating mechanism of the circuit breaker may be hydraulic, pneumatic or motor operated types. The circuit breakers are also classified as live tank type or dead tank type. In case of live tank type breaker the enclosure of the breaker is at line potential. In the dead tank type breaker the enclosure of the breaker is at ground potential. The dead tank type breaker requires additional oil/gas for insulation from the grounded enclosure. Live tank type breaker requires less oil or gas. More on Circuit Breaker is discussed in subsequent articles. Hey hi..i just read your article. it's really informative. i think you done great work. Thank you for sharing such a nice information. Hoffman products Europe's leading distributor of Enclosures items & free next day delivery for business customer ... Electrical, Automation & Cables; Automation & Control Gear.